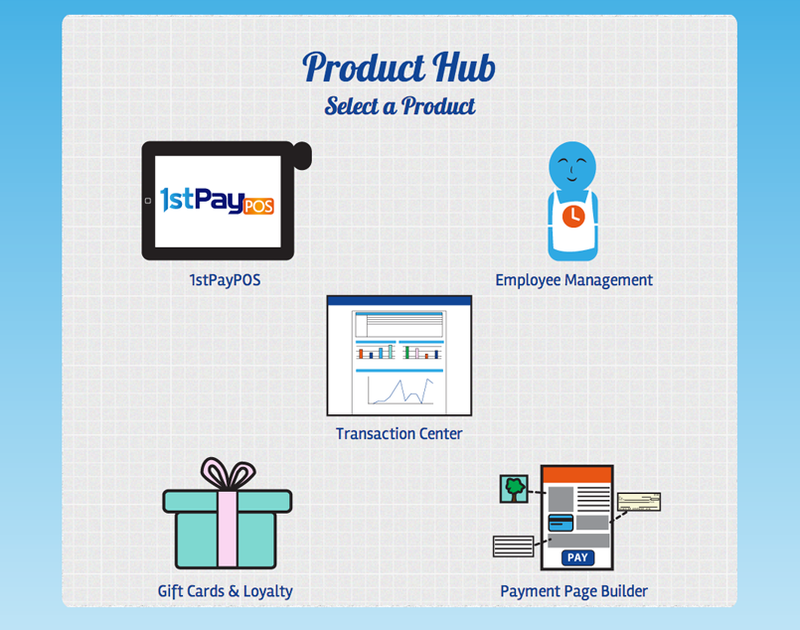 The Product Hub allows the merchant to access products offered by 1stpaygateway. Only the products that are enabled on your account will be accessible. To add products, please contact your Sales Office. Click on the bar to the left to open the menu. Select on "Go to Product Hub". Log into your transaction center. Enter login credentials found in your original account activation email. Click Login. This will take you to the Product Hub. Below is a description of each of the products that can be accessed through the Product Hub. 1stPayPOS allows you to offer the 1stPayPOS Portal. This iPad Point of Sale Portal allows you to track cash and credit card sales, manage inventory and employees, print detailed analytics reports, and more. Employee Management allows you to view and edit employee hours, manage employee information and profiles, and create labor reports. The transaction center is where credit card and ACH payments are entered, bypassing 1stPayPOS. Receipt options, customer information management (CIM), recurring billing, and general account optios are configured here. Gift Card & Loyalty allows you to sell gift cards, manage loyalty customers, and configure customer rewards. Enter customer contact information and payment methods, and manage reward & gift card balances. This is an add-on service for 1stPayPOS. The Payment Page Builder is an add-on product to the Transaction Center. It allows you to build customized, easy-to-use web-based payment pages. Accept both credit card and ACH payments, set up recurring payments, and advertise your campaigns through social media with this tool.